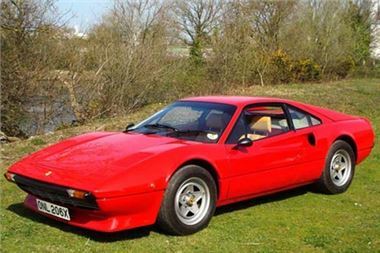 A 1981 Ferrari 308 GTBi kept bidders busy at Barons’ sale at Sandown Park on April 17th. The bright red Italian sportscar, in storage for the past decade and now requiring re-commissioning, had a guide price starting at £13,000, but after a prolonged bidding battle it finally sold for £24,600. In spite of unseasonably cold weather, the saleroom was busy with sensible "come and buy me" reserves resulting in lively bidding and excellent prices for the featured lots. This was also the first time that Barons had operated a live video link, allowing people to watch the auction action from the comfort of their own homes or offices. This was also the first time that Barons had operated a live video link, allowing people to watch the auction action from the comfort of their own homes or offices via www.barons-auctions.com. Barons' MD Laurence Sayers-Gillan commented, "This is an exciting new development for us and one which we think will be a great advance for the future. On this trial occasion, the sound wasn't brilliant - something that will definitely be improved in time for the Jaguar Heritage sale - but the feedback from viewers was that they really enjoyed being a 'virtual part' of the saleroom, particularly when the bidding was fast and furious!" Another strongly fought-over car was the 1960 Austin Healey 3000 Mk1 which has just emerged from 33 years in storage. It soon powered well past its £8,000 estimate, finally selling for £16,800. The buyer was overjoyed to secure the car, as owning a ‘big Healey’ has been an ambition for 10 years, and this rolling restoration offered him the opportunity to achieve his dream. The rally-prepared 1969 MGC GT was a real bargain at £8,200, as it would cost at least three times the selling price to create an FIA approved historic rally car of this type. Having been laid up for five years, it needs re-commissioning, but will soon be ready to tackle those rally stages again. Barons now turns its attention from the prancing horse of the Ferrari to the ‘big cats’, as it prepares for its annual Jaguar Heritage Sale at Sandown Park on May 29th. For further information, or to consign a car to the sale, visit www.barons-auctions.com, email info@barons-auctions.com or call 08454 30 60 60.